Information on the Creative Scotland Annual Statistical Survey for 2017-18 is coming soon. The Creative Scotland Annual Statistical Survey for 2016-17 was completed by all those receiving Regular Funding. You can see a copy of the Environment section of the 2016-17 annual report to Creative Scotland which is similar to the version which will be used in 2017-18 . For those who are new to reporting we recommend watching this Environmental Reporting step-by-step tutorial for 2016-17. Download this handy Quick carbon conversions guide – updated for 2017-18 – to check your biggest emissions impacts. Once you have collected your data you can estimate your emissions using the emissions factors in our guide. All Regularly Funded Organisations (RFOs) were required to report their carbon emissions for the previous financial year (2015-16) by 23rd September 2016. 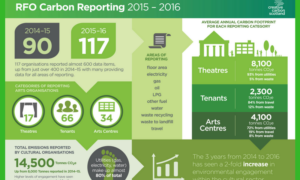 In 2015 – 16, significantly more organisations submitted carbon emissions information, with 117 reporting compared to the previous year’s figure of 90 and a 31% increase in the amount of data reported. Click on the infographic to download your copy of the report. See how the sector is progressing and find out where you fit in. RFOs were invited to provide information on their environmental impacts in the Environmental section of Creative Scotland’s Annual Statistical Survey reporting form for the period 2014-15. 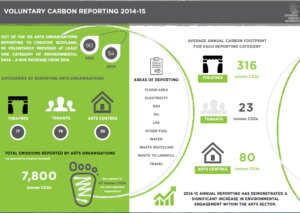 We analysed the data sent to Creative Scotland and have produced a short report on Voluntary Carbon Reporting 2014-15. Click on the infographic to download your copy of the report. See how the sector is progressing and find out where you fit in. “Conversations with Green Champions” includes important highlights and key knowledge gathered from our meetings with Creative Scotland Regularly Funded Organisations between January and May 2015. You can also check out our online tools and resources.